So, it is no secret that we aren’t working on the house everyday. Its true that the folks at Lowe’s don’t know us by our first names. We do however, spend what feels like all of our free time working on or thinking about the house. Between the wedding and the house hunting and the house buying and the house fixing and the yard work, we haven’t really taken much time in the last 6 months to just relax. This weekend we “took the weekend off.” Well, as much as we can take off. I decided to make good use of our time and teach Megan about lighthouses and some of our surrounding areas. We went to Sandy Hook and Fort Hancock, NJ, which are parts of the Gateway National Recreation Area. 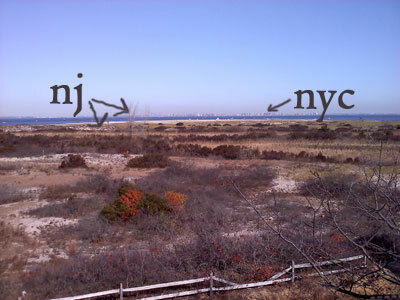 Without getting too deep into it, Sandy Hook (from the Dutch word “Hoek,” meaning “spit of land”) is a narrow spit of land that naturally guards Lower New York Harbor and the Raritan Bay from the Atlantic Ocean. That’s the view from the tip of the hook. 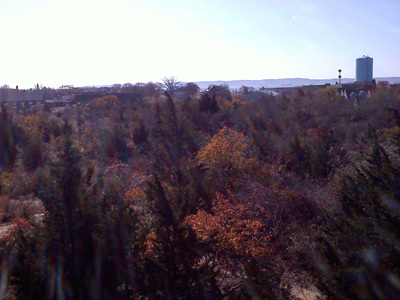 The National Park is home to Sandy Hook Light, which is the oldest working lighthouse in the country. It is also home to all sorts of other fun stuff; a U.S. Coast Guard station, an army installment dating back before WWI, a stash of Nike missiles, some crazy flora & fauna and some great views of the greater NY/NJ area. I think my favorite part about Sandy Hook is the feeling you get when you’re mere miles from one of the largest cities in the world, yet you feel quite remote and alone. That view is looking back at the mainland. Our house would be somewhere along that far ridge and about 10 miles to the right. As part of our “weekend off” we didn’t bring our camera, so we just snapped a few phone photos. We toured a few more parks in the area and enjoyed the fall foliage before heading home to, you guessed it, get some work done. OK, so we broke our own rule. Big deal. We got some a lot of yard work done and hung some new blinds. For more about that you’ll have to wait for another blog post! That’s right, folks. We’re getting hitched today, 9-30-2011! 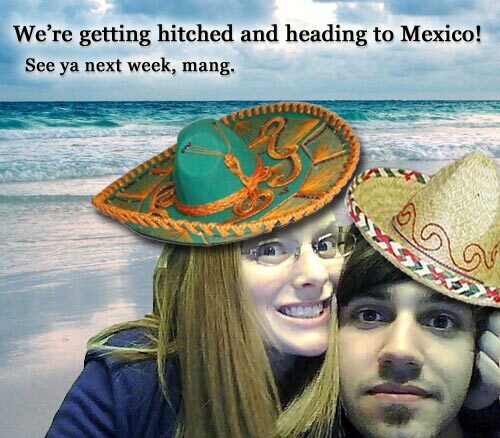 Then we’re heading down to Mexico for a week, so we’ll see ya when we see ya! But stay tuned – we may do some tweeting from Mexico, so be sure to follow us on Twitter! We’ll have plenty of great wedding + vacation photos and stories for you when we return!